Front-of-face bangs make an impact and highlight your facial features. 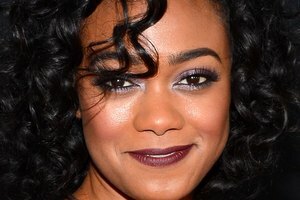 If you're looking for an unapologetic hairstyle, thick bangs that hug the front of your face will do the trick. This style of fringe works best on straight-hair textures to create that sleek, eye-enhancing look that celebrities like Zooey Deschanel are famous for sporting. 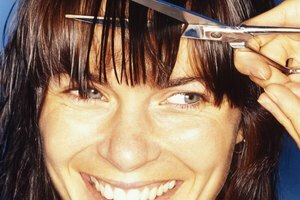 Investing in a pair of high-quality hair-cutting shears will also mean a stunning finish if you are cutting these front-of-face bangs at home for the first time. Fantastic fringe is just a few snips away! Begin with clean, dry and straightened hair. Always cut bangs with dry hair to avoid cutting off too much length. Place the tip of your fine-tooth comb on the top of your head about 2 inches back from your hair line. Draw an angled line that goes from this top point down toward your right temple and forward toward your hairline. Draw the comb down until it is even with the edge of your eyebrow. Pull this right section of hair forward away from the rest of your hair. Repeat this angled sectioning on the left side of your head to create the section that will become your bangs. Make sure the lines are clean and even. The section should be shaped like a wide V on the top of your head. Clip back the rest of your hair with a few large alligator clips so that you do not accidentally cut the wrong hairs as you work. Comb forward the loose bang section a few times so that the hair hangs down over your forehead. This process will train the hairs to lay in the direction you desire and remove any leftover snags or tangles for an even cut. Place the the fine-tooth comb at the top of the sectioned hair and slowly pull the comb down along the bangs over your forehead until the comb is parallel with your pupils. Always aim to make the first cut of the bangs longer than you plan on wearing the hair. You will gently trim your bangs to the desired length later. Hold the comb firmly in place and parallel with your pupils, so that the hair is captured on the comb across your eyes. Make sure the comb is perfectly horizontal. Trim across all of the hair below the comb with a pair of hair-cutting sheers. The goal is to create a clean line across your eyes to begin the bang-shaping process. Comb through the bangs another time after trimming off the excess length to uncover any leftover, hidden long pieces that need to be trimmed. Trim off any leftover long hairs. You should now have long bangs that hang over your eyes in a neat, straight line. Comb through the bangs as you did before and capture the hair evenly and horizontally so that the comb is parallel with your eyebrows. Cut into the bangs holding the scissors vertically this time. Using small, gentle snips, trim away about a 1/2 inch of hair. This technique, called point-cutting, will soften up the effect of the bangs and help you get the desired length for your bangs. Trim very slowly and carefully. Repeat this combing and trimming process a few times if you want shorter bangs. Only do one or two rounds of point-cutting if you want longer bangs that hit closer to your eyes. You can also opt to point-cut your bangs up until they sit above your eyebrows for a shorter look. Comb through the bangs a final time. Trim away any long hairs that were missed in the cutting process. Walk away from the mirror every once in a while and come back to the haircut to make sure you like how the bangs are taking shape. Vrba, Sarah. "How to Cut Bangs on the Front of the Face." Synonym, https://classroom.synonym.com/cut-bangs-front-face-23396.html. Accessed 24 April 2019.